Everything suggested an American attack was imminent… until Putin and his five-star Foreign Minister made magic and amazed us all by buying Assad a little more time. While never-ending debates about intervention were still invading the media and after the UK Parliament threw a bucket of cold water on the idea of a Libya-style Western-led operation, President Obama decided the US congress would have the last word on any eventual attack. It appeared the Republicans supported this move and, even though a vote has not still been cast, it seemed only the moment and exact target were still to be decided. The Russians had already shout to the four winds they were against such an action, despite their having admitted the use of chemical weapons and their agreeing on the inadmissibility of such an attack. Regardless of this, the US retaliating with a bunch of missiles was not an option, responsibility to protect was not really at stake and it was nobody’s business to stick its nose on a strictly civil conflict. Surveys across both the West and the Arab world started to make clear a huge majority of most populations were against repeating the Iraq scenario. Maybe the situation was different and the aim was not entering a war, but the sole idea of imagining foreign troops on Arab soil after 2001 and 2003 is still unbearable for many, understandably much more worried about the numbers of unemployment or their educational deficiencies. Having that in mind or not, Secretary of State Kerry seemed to back up a bit when he announced the Syrian regime may avert an attack if it gave up its entire arsenal of chemical weapons. The Russians were swift to catch on the fly and announced a proposal whereby both Russia and the UN would supervise the gradual eradication of this kind of weapons. Syrian Foreign Minister Walid al-Moualem said Damascus was ready to cooperate on the Russian initiative, thus admitting at least the regime’s being in possession of those arms, something they had been belying up until now. In order to reinforce its position, Damascus announced its decision to join the 1992 Chemical Weapons Convention. Most of us, aware of what a US attack could entail, heaved a sigh of relief. The problem is that Assad probably did too. He had (inadvertently?) got rid by a whisker and had also managed to put all pressure on the international community, specially on an organization which has up until now and for more than two years shown utterly unable to stop the killings of innocent civilians, that is, the United Nations. It’s not as if the United States’ credibility being at stake was everybody’s top priority, but the fact that the sole remaining world gendarme has been mocked twice by a reckless rogue element like Assad should maybe be considered as a little bit worrying. Several loose ends should be thus tied in order to ensure Assad and his allies don’t get away with believing they can fool us all. First and foremost, Russia’s proposal should be backed by a UN Security Council’s Resolution. A text that would require Russia (and China) to cede on their undaunted stance of “after Libya you won’t get another abstention from us, guys; enough is enough”. A text that would endow the Russian proposal with much more (and desperately needed) credibility. A resolution that would make clear any kind of unfulfillment will mean legitimized retaliation on the part of the whole international community, not just the US. Secondly, the Resolution should also contemplate an eventual political solution to the Syrian conflict. The international community should let the Syrian people know it is not just about the use of chemical weapons, that they also care about putting an end to the loss of life and destruction of families. Syrian rebels are already saying that such a move will not stop the killing, for Assad still has plenty of conventional weapons at his disposal and is merely trying to buy time with the help of the Russians. Because some may consider a UNSC resolution to be mere words the wind will eventually carry away, a new framework (Geneva 2) might allow to reassess the situation and, above all, to cast light on what the real possibilities for a diplomatic solution are. Consequently, all stakeholders will maybe be able to shift their stances based on new considerations, on everything they have learned until now. Primarily, they might have to revise their posture on Assad and his entourage’s being obliged to leave. 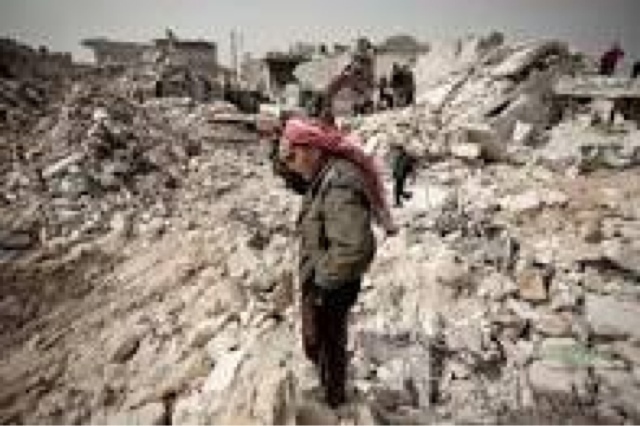 It is clear that Assad and others have (much) blood in their hands but, as the Middle East Peace Process has shown many times, immovable preconditions and peace negotiations are not good bed fellows. On the other hand, and even if that deeply alienates both America and other key allies such as Israel and Saudi Arabia, Iran (and thus Hezbollah) should be made part of the process one way or the other. As a matter of fact, Saudi Arabia and Qatar should realize they are not in a position to control the process, which exclusively belongs to the Syrians (to all Syrians themselves). Other countries should stand ready to intervene, but just as amici curiae. Then there’s the so-called rebels. What to do with them? What to do with the Syrian opposition as a whole? One of the most sensible arguments against intervention was the jihadist threat: if Assad is routed, radical Islamists will be in control of Syria and will create a new fief for Al Qaeda and the likes. It is clear that there is a real danger, a danger that, unlike what happened in Irak, has been growing over time precisely because there has not been an intervention, because there was (there still is) no credible, well-funded alternative. Extremist elements have gained ground funded and secretly backed by Saudi Arabia and Qatar. And this is precisely why action should be taken, with the aim of impeding the radical wing to keep bloating. On the contrary, if Assad success in clinging to power, then jihadism is sure to thrive. Alas, what looks even more unavoidable for Syria than an American attack was is a future of uncertainty and instability. Ever since the onset, many ad nauseam foresee two not very attractive chaotic scenarios: a new Iraq and a new Lebanon. Another alternative scenario at this point could be a process of “false” democratization spearheaded by Assad or anybody amongst his accomplices, a first step that may well end up in something resembling to the Spanish model, or may lead to renewed civil conflict. Some analysis point to the Balkanization of Syria, i.e. the creation of three countries: one for the Alawites, one for the Sunnites and one for the Kurds. Regardless of the specific characteristics of the future shape of what was once known as Syria, what is beyond doubt is that further polarization and fragmentation await for Syrian society, a society that was once renowned for its culture and cohesiveness.